Happy Friday! I am still so over-the-moon excited that we’re in full swing of a new season! I have so many projects I am planning on tackling around the house and one of them is updating Claire’s bedroom! I have been crafting up ALL kinds of fun projects. 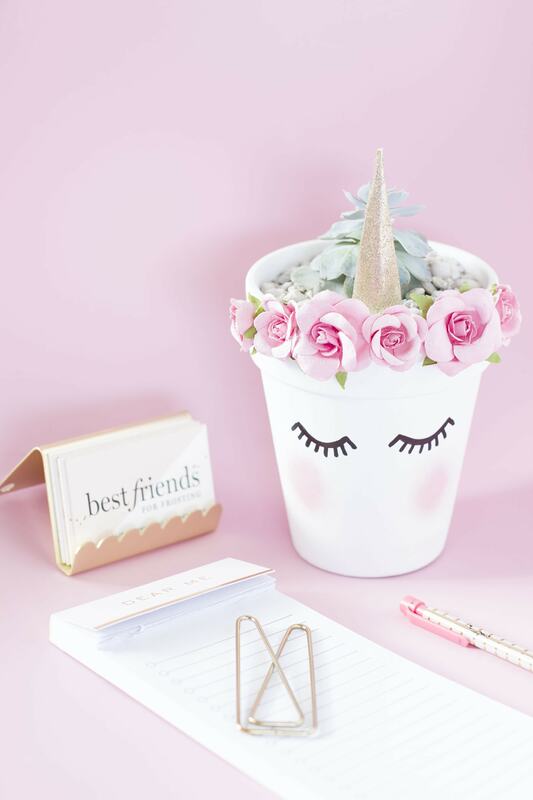 We had a high response from our 2017 BFFF Survey, and one of our readers said their favorite project topics to date are our unicorn cupcakes and unicorn cake, so I decided to make a DIY project that is perfect for a table centerpiece at a party or even bedroom decor. 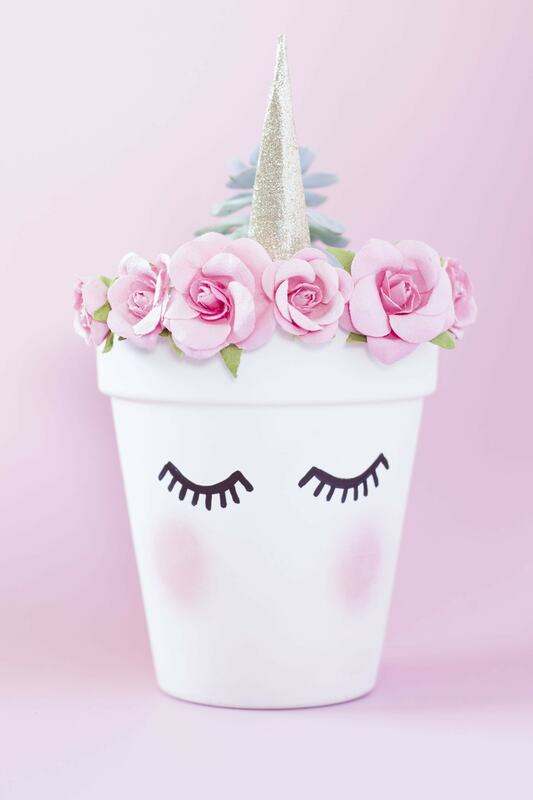 When I googled “Unicorn Planter” and “Unicorn Pot,” nothing came up! I love the idea of adding fresh plants or flowers to the rooms in my house. It makes me calm and happy to see things displayed with such beautiful aesthetic. Claire is my unicorn girl, so I had to make it happen. This project adds such a fun touch for birthday parties, baby showers, or even nursery makeovers! ;) The sky is the limit. Don’t forget to tag your projects using the #SoBestFriendsForFrosting hashtag. I can’t wait to see! Spray paint the clay pot white. 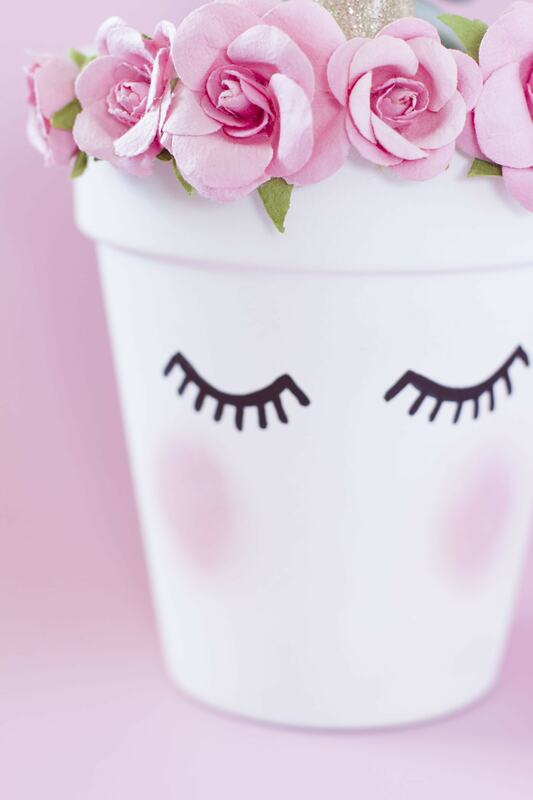 Once dry, draw eye lashes on the pot with black sharpie. 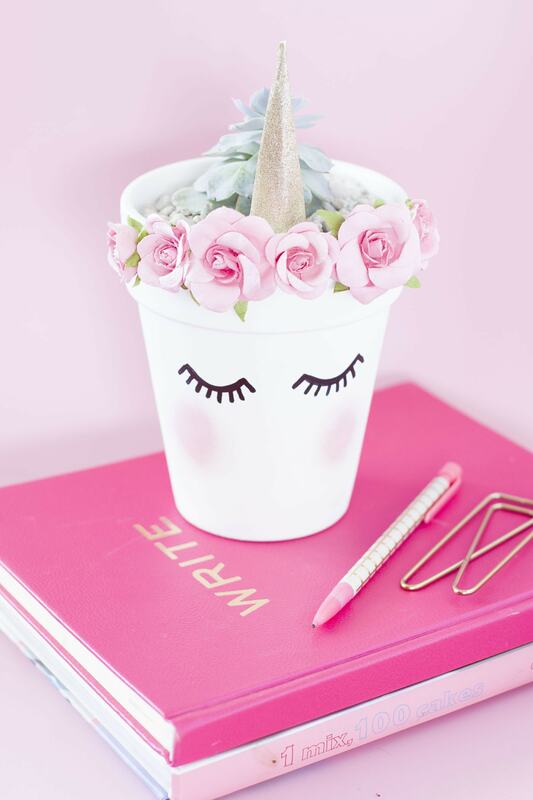 With a hot glue gun, glue the paper flowers around the top of the planter to make a flower crown. 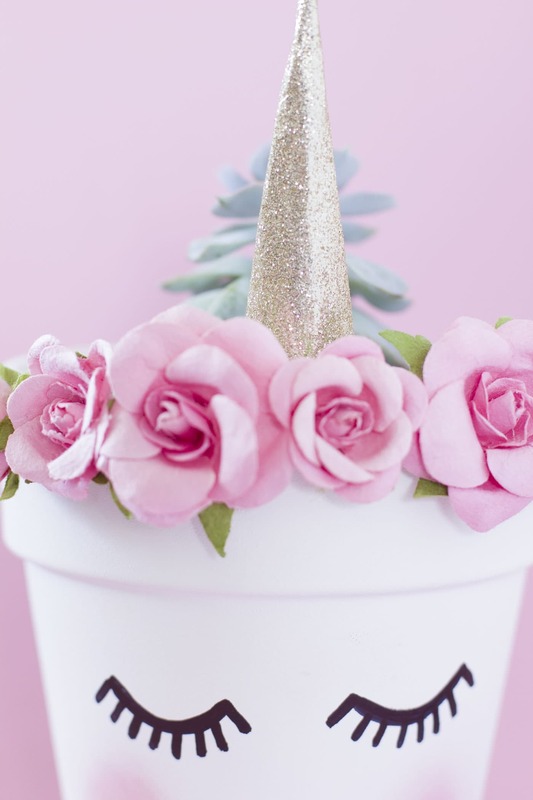 Make a unicorn horn with the gold glitter paper. Next, glue the horn on the inside of pot, leaving the horn sticking out of the center of the floral crown. Plant a succulent plant inside and add the white rocks. I hope to get into this kind of job. I’ve always loved crafts and DIY-ing! You can do anything you put your mind to! I hope you make your dreams come true. One of my favorite quotes is “A goal without a plan is just a dream”. Hope you tart making some big plans!